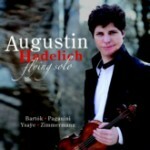 Astonishing audiences with his phenomenal technique and poetic sensitivity, Grammy Award-winner Augustin Hadelich has established himself as one of the great violinists of his generation. on numerous occasions. 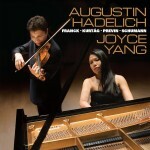 Worldwide engagements include the BBC Philharmonic/Manchester, BBC Symphony/London, Danish National Symphony, Finnish Radio Orchestra, London Philharmonic, Mozarteum Orchestra/Salzburg, Netherlands Radio Orchestra, London Philharmonic, Royal Scottish National Orchestra, SWR Orchestra/ Stuttgart, and the NHK Symphony/Tokyo, among others. 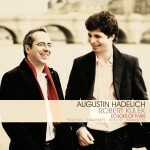 Festival appearances include Aspen, Blossom, BBC Proms, Bravo! Vail, Chautauqua, the Hollywood Bowl, Marlboro, and Tanglewood. 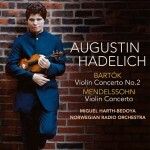 Mr. Hadelich’s previous recordings for AVIE include a pairing of Bartók’s Violin Concerto No.2 and Mendelssohn’s Violin Concerto with the Norwegian Radio Orchestra under Miguel Harth-Bedoya; the Gramophone Award-nominated pairing of the violin concertos of Sibelius and Adès (Concentric Paths) with Hannu Lintu conducting the Royal Liverpool Philharmonic Orchestra; and Echoes of Paris, featuring French and Russian repertoire influenced by Parisian culture in the early 20th century. 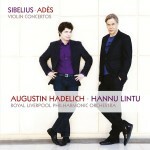 Gold Medalist of the 2006 International Violin Competition of Indianapolis, Hadelich’s 2016 Grammy Award was for his recording of the Dutilleux Violin Concerto, L’arbre des songes, with the Seattle Symphony under Ludovic Morlot. He is also the recipient of the inaugural Warner Music Prize (2015). 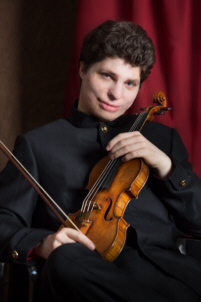 Born in Italy, the son of German parents, Hadelich holds an Artist Diploma from The Juilliard School, and is now an American citizen. He plays on the 1723 “Ex-Kiesewetter” Stradivari violin, on loan from Clement and Karen Arrison through the Stradivari Society of Chicago.